"Every time you stand at the edge of a cliff, it's completely different. You have to overcome your fear again." Imagine everything you love in life compressed into two seconds. Imagine those two seconds spinning by in a blur of deadly twists and dangerous turns. Now imagine that the only way you could get those dangerous two seconds—holding everything you love in the world-- was by jumping off a cliff. Would you do it? Anna Bader does. And she does it very well. 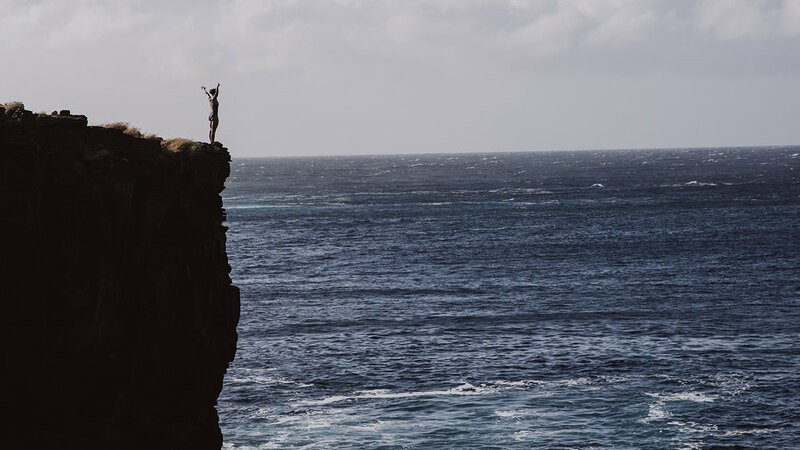 Anna Bader is one of the world’s leading cliff divers. Most people in life run away from the edge. She runs right off it. For the past 17 years she’s been diving off cliffs. In the process, she’s been piling up awards and personifying the new era of female cliff diving. When she began the sport in 2005, it was hard to find any women’s competitions. In the past decade, all that has changed—much of it thanks to Anna’s insistence of following her passion for what she calls the “pure joyfulness” of cliff diving. Every corner of this planet is impacted by plastic pollution. adidas x Parley are implementing Parley AIR to create change, raise awareness and turn threat into thread. The sport is fundamentally connected with the natural environment: cliff, sea, and the space between. As a Parley AIR Pledger, Anna is committed to reducing her plastic use and protecting the environment at the heart of her sport. In a film by Matthias Hoene for adidas x Parley, she describes how the oceans and plastic pollution put everything into perspective (Watch it above). Anna’s call to action: Fall in love with the oceans – and do whatever is within your power to protect them. As she said during World Oceans Week, "if we want our children to see the oceans as we are still able to see them, then we have to do something. If not, it's not going to exist."